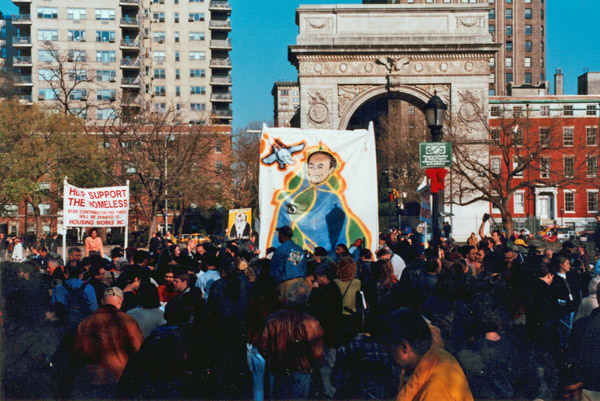 At high noon Saturday, December 4, 1999, Joey Skaggs and a team of co-conspirators marched into Washington Square Park toting a 10’ x 14’ painting of New York Mayor Rudy Giuliani as the Madonna. 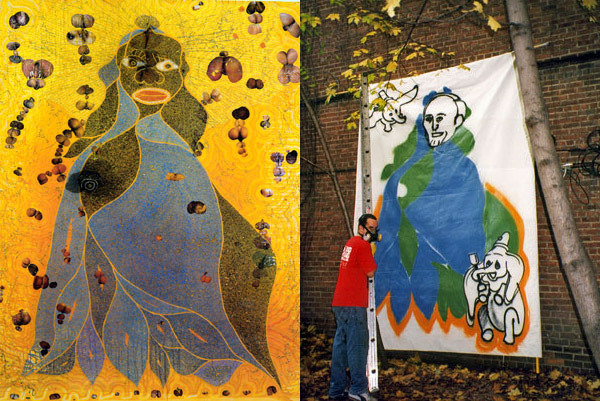 It was a satirical replica of the Chris Ofili painting “Holy Virgin Mary” which was part of the Brooklyn Museum’s “Sensation” show. The Mayor had recently attempted to defund the museum because, to him, the artist’s use of elephant dung instead of paint was offensive. Skaggs had mailed more than a thousand announcements to the media and the event was widely publicized on the radio, in the news and on the Internet. It was billed as a participatory performance piece taking aim at Mayor Giuliani’s anti-freedom-of-expression policies regarding art, as well as his autocratic and heartless “quality of life” campaign targeted against the homeless and other unfortunates in the city. For a $1.00 donation, the public could toss a handful of dung at the Mayor’s portrait. 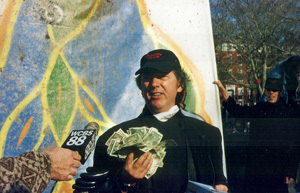 Skaggs had arranged to donate all the funds he raised to Housing Works, a non-profit organization that helps homeless people with AIDS. The atmosphere in the park was electric as hundreds of supporters reveled in the opportunity to hurl dung at the Mayor. Scores of print and television journalists came to record the event. Flanking the group was a large number of uniformed and plain-clothes police, causing an even greater circus-like atmosphere, with an overlay of threat and danger. The crew spread out the tarp and positioned the painting and the signs. Skaggs made a brief speech and a man in a wheelchair rolled forward to take the first toss. He wound up and let fly the dung. The crowd cheered wildly and then lined up to pay their dollar and take aim. Skaggs assumed that a request for a park permit would be denied, and therefore did not apply for one. He had been advised by an attorney that even if had he been granted a permit, the police would likely tell him he didn’t have the right permit and arrest him anyway. So he and his crew went to the event armed with toothbrushes, coins for telephone calls and some chocolate bars, assuming arrest was a real possibility. Preparation for the Doody Rudy event had taken weeks. 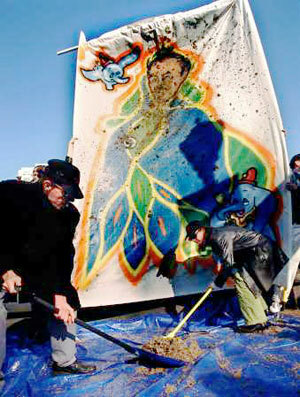 The huge canvas was hung and painted by graffiti artist Steve Powers in Skaggs’ backyard. 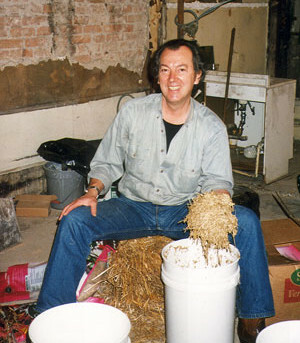 The elephant dung, made from hay, vermiculite and water was concocted and fermented in Skaggs’ apartment. Other friends provided storage space and assisted in gathering the supplies. Everyone loved the idea but, when it came time for volunteers to actively participate in the event, many were afraid of arrest. The brave souls who did volunteer–Steve Rendall, Michael Brody, Kate McCamy, Kevin Roach, Nancy and Faye Good, Steve Powers and two spotters with cell phones Julia Solis and Amy Baker–were rewarded with great satisfaction. In actuality, no one was arrested and the event was a smash hit in the eyes of the cheering crowd and the media. For many, it was a seminal moment in the life of New York City when the people stood up and let Mayor Giuliani know how much they detested his policies. The event was all the more interesting because Steve Powers, the artist who painted the Giuliani portrait, was arrested days before the event on a weapons charge for possession of a pair of antique brass knuckles displayed on his wall. This was after an extended search of his apartment for evidence related to his graffiti activities. Powers and his attorney Ron Kuby took the position that he was being persecuted because of his involvement with the Doody Rudy event, suggesting that Giuliani was aware of it, was offended by it and was going to try to stop it. The police insisted this was the culmination of a six-month investigation of New York graffiti artists and had nothing to do with the impending protest. In an amusing twist, Powers and Kuby, excited at being the center of so much media attention due to the arrest, took total credit for the Doody Rudy event in several key interviews. This caused no end of confusion about who was responsible for the event and led to condolence calls to Skaggs from friends who thought the police had searched his apartment and that he had been arrested for graffiti! Doody Rudy had all the ingredients of a great story. It was bold and satirical with humorous visuals. It was timely, in that Giuliani was in the spotlight for attempting to enforce several controversial policies that threaten the loss of basic rights: first amendment rights of self expression and basic human rights of self determination. It was provocative, loaded with controversy and conflict, made more so by the Powers investigation. It had the threat of imminent police crackdown. It offered symbolic ritual and public catharsis. And, it featured a group of fearless artists standing up against oppressive authority. Coincidence and luck played a part as well. The event had been planned before Giuliani announced his policy requiring homeless people to go to work or be denied shelter, which was followed by his pronouncement that homeless people caught sleeping in the street would be arrested and sent to jail. And the Powers arrest was a complete surprise. Piecing together and massaging all of these elements enabled Skaggs to communicate his concerns about the New York Mayor’s authoritarian policies on a global scale.